Personalized toddler boy mini airplane backpack. 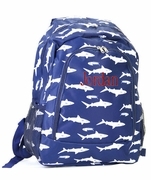 Backpacks will never be boring when they can be an airplane! This innovative design is a smiley-faced airplane with wings on either side. The body of the bag is made from plush padded fabric and decorated with flying airplanes in blue. A front pocket in red stripes adds a neat contrast. Pack up your little one’s lunch snack, treats, water cup, toys, and clothes into this fun bag and he is all set for daycare, an outing with the family or a trip to the mall with big sister. A child harness adds a feeling of comfort and can be used when needed or detached if not required.